Perk up the flavor and boost the antioxidants and nutrients in your next cup of tea by adding pomegranate juice. Use your favorite brand of black, green or even herbal tea, but when you buy pomegranate juice, check the label because the ingredients, vitamins and minerals can vary between brands. Premade pomegranate tea bags offer convenience, but you can control the nutritional benefits by brewing your own tea, then adding as much pomegranate juice as you like. The amount of nutrients in pomegranate juice varies depending on the brand and how much you use. One brand of concentrated pomegranate juice suggests mixing about 3 tablespoons of juice with 7 ounces of fluid. This serving provides 16 percent of the daily value of fiber and 10 percent of potassium, based on a 2,000-calorie-a-day diet. You'll need about 4 tablespoons of regular pomegranate juice per cup of tea. 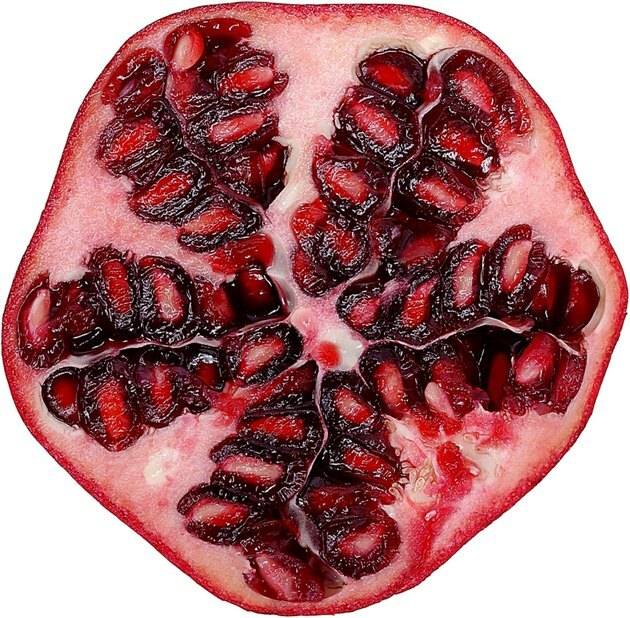 Generic pomegranate juice has 3 percent of the DV of potassium and 8 percent of vitamin K in a 4-tablespoon serving, reports the U.S. Department of Agriculture. Potassium helps lower blood pressure and maintain a steady heartbeat, while vitamin K is needed for healthy bones and blood clotting. Both pomegranate juice and tea contain antioxidants called flavonoids, which are natural, plant-based compounds. Pomegranate juice contains flavonoids called anthocyanins and anthoxanthins. The flavonoids in green tea are catechins, while black tea is a rich source of theaflavins and thearubigins, reports the Linus Pauling Institute. One benefit of drinking pomegranate tea comes from the overall increase in antioxidants because pomegranate juice has more antioxidant capacity than green or black tea, according to an article in the January 2010 issue of the "Nutrition Journal." After researchers reviewed 13 completed studies, they concluded that the catechins in green tea help lower blood pressure, according to an article published in the May 2014 issue of the "European Journal of Nutrition." This review also reported that green tea may help reduce blood levels of total cholesterol and low-density lipoproteins, or LDL, also called bad cholesterol. Pomegranate juice could also boost cardiovascular health because by preventing cholesterol from contributing to plaque buildup in your arteries, according to another review in "Evidence-Based Complementary and Alternative Medicine" in November 2012. As plaque accumulates in arteries, it can restrict blood flow and raise your risk of a heart attack or stroke. Laboratory research suggests that the flavonoids in green and black tea may help prevent some types of cancer. When cervical cancer cells were treated in the laboratory with two flavonoids -- epigallocatechin gallate from green tea and theaflavins from black tea -- both compounds inhibited growth of the cells, according to a study published in "Oncology Research" in 2011. The theaflavins in black tea may also fight the spread of prostate cancer by causing cancer cells to die, reported researchers of a study published in the August 2013 issue "Oncology Reports." However, clinical research with human subjects is still needed to verify the effectiveness of these compounds in cancer prevention.